Cotton Kiwi: My Creative Space - Party Preparations. I'm sneaking my Creative Space in a day early this week because I'm going to be crazily busy tomorrow and won't manage to do it otherwise. My Creative Space this week is all about my soon to be 4 year old and her upcoming Flower Fairy Birthday Party. I am having SO much fun with the preparations for her party and so is she. She has been my little helper all day today. We've made some paper flowers from napkins. And we made some fairy bunting using an op shopped flower fairy book that Eloise spotted (makes me so proud!). Just cut the book pages into triangles and zig zag stitch onto ribbon. So quick, so cute! And these are my favourite. Party loot bags made from another old childrens' book. 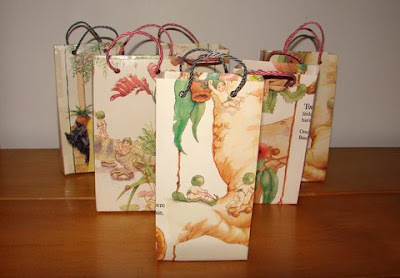 There is a tutorial for making gift bags here which is roughly what I did, without all the reinforcing. I can give you measurements and instructions for my version next week if any of you are interested? They are super simple to make. 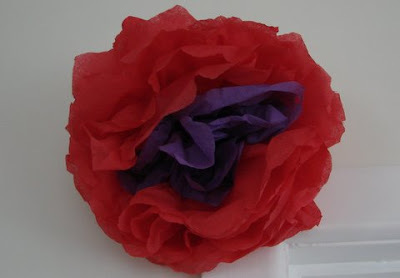 If you can wrap a present, you can make these. A few more bits and pieces to do before the weekend's party and then it's all decorating and party fun. Can't wait! For more Creative Spaces, pop over to our lovely host Kirsty's blog, Kootoyoo. OOOoooo they look great! What a lucky girl. 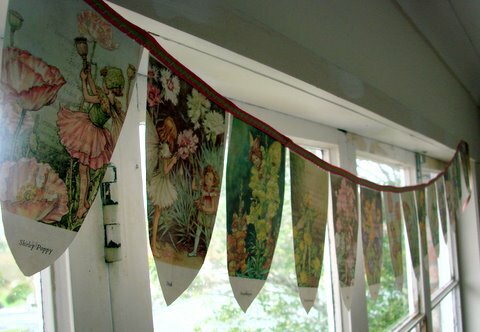 I espically love the fairy bunting! Great work. So much effort and it's all so to-theme and cute. I hope everyone has a spectacular time! Oh my goodness it's all soooo exciting and pretty i wish Charlotte and i could come!! Love love love the flower fairy bunting!!!! Lucky you had such a clever helper out on the prowl for bargains! 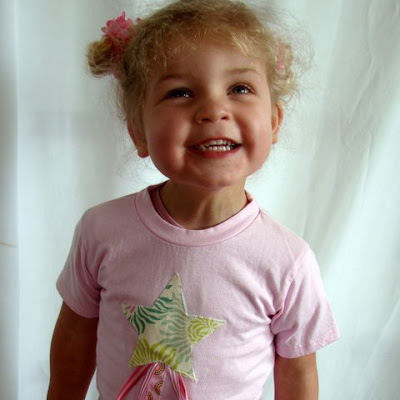 SO cute, you are very clever, and happy birthday to big 4 year old Eloise! Happy Birthday, such a cutie pie..The decor is so adorable!! I love the bunting! You have done a great job with the decorations. Have a fun party. wow would never have thought of paper bunting wow!! i miss the days of organising children's birthday parties and you've done so well. they bunting and party bags look wonderful. Love the party bags! Thank you for sharing. I hope your little girl has a lovely day and party. Aw, that's all so adorable. Love the cute recycling ideas too, those book bunting and loot bags are brilliant ideas, you and your helper should be proud of yourselves!